Before we head to the store, I try on at least three shirts before deciding to go with full-on exercise clothes and running shoes. This is a marathon after all. For this reason, the obvious first stage of registering, which starts days before we get to the store, is excitement—nay, fantasy. I stay up late scouring Pinterest for registry guidelines and texting my mom about her houseware recommendations. Even Andrew repeatedly expresses his eager anticipation of the day. A sense of euphoria overcomes us as we consider the possibilities. The euphoria is short-lived, however, ending just about when Andrew and I arrive in the Target parking lot. Now faced with the very possibilities that once sounded so exciting, we suddenly become aware of just how much decision-making is going to be involved in the day. I am filled with dread as I anticipate the overanalysis and arguments just waiting to happen. Registering for a wedding at Target has got to be like the IKEA test on steroids. We stop by the customer service counter and pick up the red iPhone used to scan barcodes and then gird our loins by getting caffeine at the Starbucks in the entrance to the store. “And give me whichever Kind bar has the most protein,” I say to the lady behind the counter. I’m going to need it. This sense of dread is probably also somehow manufactured by the Target consumer experience geniuses because, look, it just got us to spend $11 on coffee and granola bars. Consider everything: the mantra of the inexperienced register-er. I am now doing the very overanalysis I feared I would do, and we’re not even to the Crockpot aisle yet. I rule out mirrors, and we proceed. One cute thing about Andrew is how much he loves Crockpots, so I let him do the thinking in the first aisle. He scans our first registry item with the red iPhone: a programmable Crockpot. We round the corner into the coffeemaker aisle. A coffeemaker is a top priority for me because right now I use my roommate's every day. We are greeted by approximately 37 coffeemakers from which to choose. Do we want 12-cup? Filterless? The fancy, expensive Ninja kind that might be fun but also might be crazy to register for? We choose one in the middle and register for it. Andrew says it's a good brand. "Let me just check the reviews," I say. Terrible. We un-register for it and select another. So many questions run through my mind: What’s a good blender? What’s a good blender price? Will we really use a blender? What will we blend? Where would we store the blender? How would we clean the blender? “Or maybe we should read some reviews,” I offer. “We can’t read reviews about everything,” Andrew says. 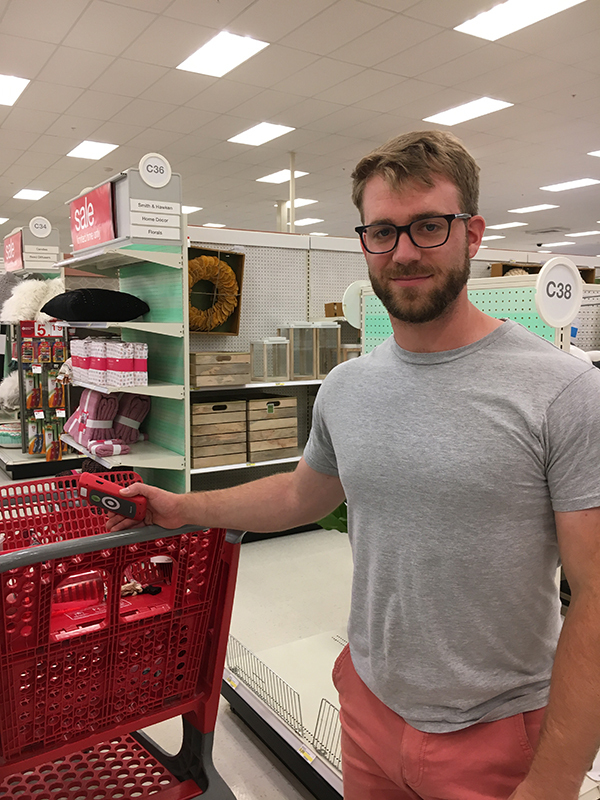 He is right—we got three aisles in before realizing that if we read reviews of everything, we will be inside of this Target until death do us part. We skip the blender. Because we cannot continue to research everything, I decide on a new mantra to help me make decisions faster: WWJD? Except Joanna, not Jesus. What would Joanna Gaines do? Would Joanna Gaines register for the teal hand mixer? NO, JOANNA GAINES WOULD REGISTER FOR THE WHITE MIXER. I put the white mixer on the registry. One aisle later, Andrew speaks up. We are examining Dutch ovens, which I saw on many a must-register-for lists. "Let's do the red one," Andrew says easily, as if choosing a Dutch oven color is not a major life decision. "I like the gray," I say, loyal to Joanna. "Gray is so boring," Andrew says. “The red is on sale." "The gray is also on sale," I point out. “I’m just worried everything in our kitchen is going to be gray and white," he says. He reluctantly scans the barcode for the gray one. The tension is growing as we turn our attentions to the cooking and baking tools against the back wall of the kitchen department. I am examining measuring spoons, and he is sidling farther away from me, already looking at graters. "I feel like you are annoyed at how long I am taking," I say, "when you move down the aisle without me." I anticipate annoyance from him, but he returns to my side to listen to my thoughts about measuring spoons. We register for mostly KitchenAid spoons and spatulas, then delete them all and register for OXO ones instead. This is the life of the register-er. We turn into the silverware aisle, and I squat down to examine the subtle differences in handle design. “I don’t know much about choosing silverware, except that apparently weight is important. Like, the heavier it is, the fancier it is. … There’s no way to tell how heavy these are,” I say, trying to tug a single spoon away from its companions inside the box. “But I do like this one,” I say, lifting the box of Oneida utensils. “The small forks are weird,” Andrew says, standing above me. “And I will only use small forks.” Who knew my weightlifting fiancé eats his 4,000 daily calories with only the small forks? I put the silverware back. The small forks were kind of weird. “I do not think people will comment on how heavy the silverware is,” Andrew says, showing his lack of Amazon experience. Having abandoned hopes of choosing silverware, we progress through the bakeware aisles quickly. I just register for everything my mom has. In the towels and potholders aisle, I unsuccessfully try to convince Andrew that he needs an apron for Thanksgiving. We register for all gray everything and make our way to the dishes. I already know the dishes I like because I’ve admired them ever since they were released: the Threshold beaded porcelain plate set. I picture my friends sitting in my imaginary future home, eating chili from the beaded bowls. We are so cozy and quaint. I show the beaded plate set to Andrew. “Yeah, I don’t like those. Sorry, babe,” he says. “You really dislike them? Or they’re just not what you would pick?” I ask. “I really don’t like them,” he says. “Okay, that’s okay. We can get the plain white ones,” I say, being a really good human. I swallow my hopes and dreams as we round the corner into the plastic dishware aisle. Is this a trick question? I will eat pizza off any plate on which you hand it to me. “Andrew,” I say, “I can’t stop thinking about the beaded plates.” My good human-ness has lasted for approximately half an aisle. “I’ve admired them for years.” I want to concede, truly, but WHAT ARE CHILI PARTIES WITHOUT BEADED PLATES? My heart wells up, full of love for those plates. Just kidding. FOR THE MAN. I know you’re not supposed to keep score in love and marriage, but at this point, he has conceded on the Dutch oven, the color scheme of everything we’ve purchased, and the plates. I have conceded on the grater, which I thought we didn’t need and he thought we did. So I think he’s winning. By which I mean, I’m winning. Like I said, we’re not keeping score here. Having completed the first major leg of our marathon, the front of the store, we now head to the bedding section. We are going to keep his queen-sized mattress, which means my beloved current crushed-white-linen full-sized duvet cover will not fit. “Okay, you pick your favorite, and I will pick my favorite, and then we’ll show them to each other,” I say. We both peruse the aisle. I stop to read the labels on only the white and gray ones because I am nothing if not consistent. “Do you have yours picked?” I say, having chosen my favorite, which is—surprise, surprise—a white linen duvet cover, but queen-sized! “Yes, this one,” Andrew says, pointing to a bedspread that has stripes made of faint patterns of pale blues, oranges, and browns. It’s fine (hard to go wrong with Threshold), but it’s not something I would pick. I tally our concessions, knowing my turn to give something up for his sake is long overdue. But we need our bedroom to feel like a European spa! Also a rustic farmhouse! Both are achievable with crushed white linen. “Is it okay if we don’t get that one?” I say, ignoring my turn. We register for the white linen. I have never been so in love with this man. “I’m really hungry,” Andrew says. Being selfless and amazing burns a lot of calories. At this point, my starving, selfless fiancé reaches the highest stage of registering at Target: nirvana. He has ascended past the overanalysis and bickering and reached a point where he no longer feels any pain or suffering. He feels only sheer bliss—or at least this is how it appears to me because approximately twice an aisle he stops me in my decision-making to hug me and tell me what a good job I am doing. This puts me in my own state of bliss. He cheers me on as I debate shower curtains, unsatisfied with any of the options. I repeatedly “decide” on one, only to undecide and then decide on a different one. Each package I lift is met with a hug and a “Good choice” from Andrew. “That one looks great,” he says about one. “I like that one,” he says moments later, wrapping his arms around me as stare at another. He has become an affirmation machine, existing only to comfort me and applaud my choices. It’s awesome. My flashlight criteria include not only the ability to shine, but also the heaviness: If I hit an intruder over the head with it, will it knock him out? We complete the rest of the housewares department—baskets, lamps, ironing boards, flashlights—in this state of mutual bliss, distracting ourselves from the task at hand with squeals about the fact that WE ARE GETTING MARRIED AND MOVING IN TOGETHER AND GOING TO HAVE AN APARTMENT AND EVENTUALLY BABIES AND LIVE HAPPILY EVER AFTER SURROUNDED BY STUFF FROM TARGET. The man is ready for some food. It should be noted that before we leave and get said food, he dutifully tries on t-shirts in the men’s clothing section at my request because we are getting our engagement pictures taken a few days later and he needs a gray (gray!) t-shirt. WHO IS THIS MAN!?!?! The next morning as we drive to church, I comment to Andrew about his nirvana-like state the day before. So maybe Andrew had not, in fact, reached nirvana, but rather had reached a state of warm and cozy delusion. Either way, it worked out pretty great for me. And after a day full of decision-making and planning for the future, I found myself feeling excellent (👌🏻💯) about at least one decision: the man.